We spend a lot of time here at Legacy.com thinking about the ways people memorialize their loved ones. When my grandfather retired from the steel mill, he moved to Myrtle Beach, SC, and started pier fishing. He spent countless hours on the pier, reeling in fish after fish. When he passed away, there was little question what we should do with his remains. We had Grandpa cremated and we scattered his ashes in the ocean. When my grandmother passed away 9 years later, I joined my parents, aunts & uncles, and cousins for a memorial service on the pier. Her remains were placed in a biodegradable bag and the funeral director had attached a rose to the bag. 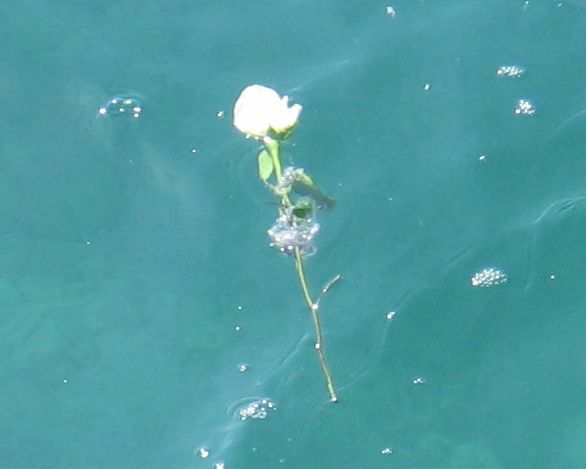 We released Grandma into the ocean, and several minutes later the rose floated to the surface letting us know that Grandma and Grandpa were once again together. And that brought us a great amount of peace and comfort. Send your loved one to space: Celestis, Inc. made the news in back in 1997 when they launched 1960s icon Timothy Leary and Star Trek creator Gene Rodenberry into space. With prices ranging from $995-$12,500, you can send your loved one on a mission into space, launch them into orbit around the Earth, place them on the lunar surface, or send them off into deep space. More information: http://www.memorialspaceflights.com/. Get some ammo: Started by two state law enforcement officers, Holy Smoke will place your loved one’s remains into almost any caliber or gauge of ammunition. Your loved one can then have one last hunting trip, a 21 gun salute, or just a place on your mantel. Cases of shells are available for $850. More information: http://www.myholysmoke.com/. Start a coral reef: Eternal Reefs combines concrete and your loved one’s remains to cast and create a reef. The reefs are then placed in the ocean where they become habitats for marine life. Ranging in size from two feet high by three feet wide to four feet high by six feet wide, the reefs weigh in at 400-4000 pounds and are priced from $3,000-$7,000. More information: http://www.eternalreefs.com/. Turn him into a diamond: When my Uncle George passed away, my Aunt Dee turned to Chicago-based company Life Gems to turn his remains into a diamond pendant. That way, she could feel like she had him with her every day. Prices start at $2490 and vary depending on the size and color of the stone. The company offers discounts if you order multiple stones. More information: http://www.lifegem.com/. Set off some fireworks: Angels Flight offers choreographed fireworks displays that are set off as part of the memorial service. Intended as a means to celebrate life, your loved one’s remains are loaded into the fireworks shells and scattered into the sky as the fireworks explode. Prices start at $3,750. More information: http://www.angels-flight.net/. Create glass artwork: A small amount of remains are infused within layers of hand-blown glass to create a memorial item. Memory Glass offers products ranging in price from $150 for a pendant to $400 for a large orb. More information: http://www.memoryglass.com/. Send her on a skydive: Blue Sky Goodbye will take your loved one on a final sky dive and scatter their ashes 11,000 feet above ground. While you cannot join in the dive or observe, they digitally record the dispersal for your later viewing. They do not have a set price, and instead ask for donations. More information: http://www.blueskygoodbye.com/. Travel to the heavens by helium balloon: For $995-$2500, Eternal Ascent Society will put your loved one’s remains in a 5 foot balloon that they fill with helium and release. Once the balloon reaches an altitude of approximately 5 miles, the balloon crystallizes and fractures and the ashes are scattered. More information: http://www.eternalascent.com/. Even if a sparkly diamond or round of ammo isn’t for you, it’s never too soon to make plans or to talk about your final wishes with your family. This entry was posted in Legacy.com Guides and tagged Cremation, Tributes. Bookmark the permalink.